I had a message from David about another great masterclass happening in London on the 10th, well worth getting down to this if you can! I transcribed this ages ago when I had more time (and patience!) and finally got round to making it into a video, hope you check out more stuff starting with “Live at Smalls” – great album. I’ve been lucky to see and play some great gigs this year; below are some of the highlights. In April I saw Jonathon Kreisberg in Birmingham with his trio, other worldly jazz guitar sounds. I was intrigued by him putting his hand in (olive?) oil in between all the tunes, not seen hand lubing like it! Also got to hang out with Howard Alden in Wales and had a little play as well, what a complete jazz guitarist, amazing. 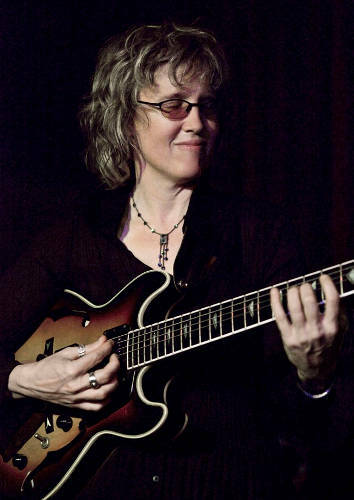 In May I had the pleasure of Sheryl Bailey as a house guest for a week and we got to have many jams in the sweltering UK summer, yes, it was the one really hot week we had… Did a gig with her as well on the Sunday which was great fun. Sheryl has worked so hard and got to such a great standard of musicality, I urge anyone to search out her albums. In July I saw Pat Metheny at the Barbican with Antonio Sanchez, Chris Potter and a bass player Ben ? What an incredible band, Pat puts on such a great show and displayed every side of his complex music from solo acoustic to Orchestrion to full on wig out, legend. October I got to see a band I’ve always wanted to check out, the amazing Soulive with the smooth but funky guitar of Eric Krasno. All three are just incredible musicians and play so well and tight, we had unbelievable seats at Ronnie Scotts, my leg was literally resting on the stage next to Neal’s heavyweight Hammond/Clavinet/bass keys set up. I still think I’m deaf from the Ampeg/Vox AC30 and Leslie combos…This month I’ve caught 2 gigs with one of the UK’s best guitarists Phil Robson who is a good friend; man what a smoking player! Playing wise I’ve done 35 gigs this year (up to now) which have been great fun, still got a residency at Number Five in Derby and done plenty of gigs with the Moja Quartet and various quartets including the Tea Curfew organ band. I hope to meet and have interaction with of few more of you next year, stay in touch! Check back as other dates and details may change.